Wengen is a village in the Bernese Oberland in the canton of Bern, located in central Switzerland at an elevation of 1,274 m (4,180 ft) above sea level. It is part of the Jungfrauregion and has approximately 1,300 year-round residents, which swells to 5,000 during summer and to 10,000 in the winter. 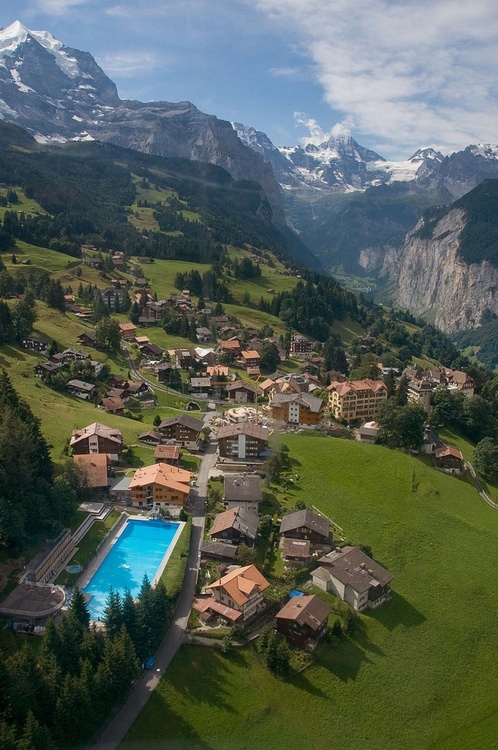 Primarily an alpine farming community, the village began to be visited by tourists in the early 19th century, when Felix Mendelssohn, followed in the 1817 publication of Mary and Percy Bysshe Shelley's History of a Six Weeks' Tour and Byron's Manfred, in which the scenery of the area is described. This became the advent of the modern tourism industry for the village.